To follow from my previous post on Sake, here is a new Hideyoshi Sake, sparkling this time, which should arrive at the store very soon. 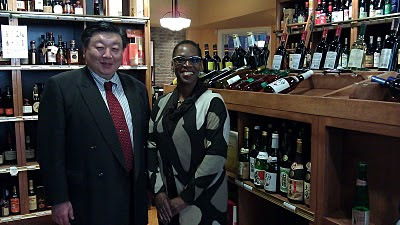 It was introduce to me at the last visit of Linda Noel Kawabata and Mr. Naoki Suzuki, owner and 19th heir of the Suzuki family, founders of Suzuki Shuzouten Brewery Hideyoshi Brand, in the Akita region, northern Japan. Surely one my favorite Sake brewery, amongst all the ones that I tasted lately. And with that sparkling Sake, Mr. Suzuki and Hideyoshi did it again. 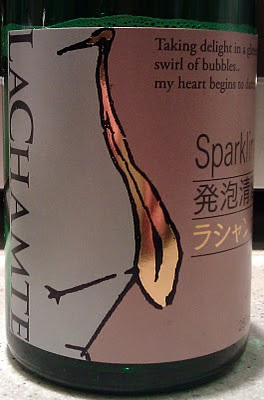 They succeeded to craft a really enjoyable, versatile and seamlessly good sparkling Sake. Pale, clear, yellow-greenish color with tiny multiples, delicate bubbles. Rather fresh, the nose boasts yeasty, slightly farmy aromas of hay, chamomile, wheat and nut mingled with mineral notes. Somewhat quite different from the nose, yet friendly and really enjoyable, (almost dangerous, it's so good! ), the fragrant palate is young, fresh, delicate, light and fruity. It offers mineral, peachy tones in a fresh, balanced, harmonious, gentle profile up until the end. I love it. For those of you that may remain skeptical after sniffing it the first time, know that the yeasty nose give way to a charming, rather simple yet extremely enjoyable and palatable drinks. It is too easy to drink, you will surely finish the bottle without realizing it. Highly recommended, drink this sparkling Sake, chilled, as a refreshment by the end of the afternoon or/ and as an aperitif. I've been reading books about it and the brewing process for sake differs from beer brewing as well, notably in that for beer but we can't avoid those elements.